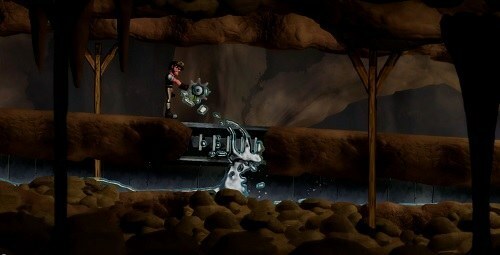 Vessel is a puzzle game with steampunk elements that focuses on physic puzzles based around liquid. The game was released in 2012 and has proven to be popular among puzzle fans and the media for its unique mechanics and simulation of fluids. In Vessel players will be jumping into the shoes of M. Arkwright who is an inventor of Fluro, one of the core mechanics in your puzzle adventure. This Fluro was created in order to create liquid beings to perform labour tasks as it was shown to be more efficient than human beings. Unfortunately Fluro did not perform as planned when introduced and caused the machinery in the world to malfunction. It’s now up to you as the original inventor to set the world straight again by bringing the machinery back online. In order to do so you’ll have to use the Fluro that caused the problem in the first place. Fluros can be made from all sorts of liquids and aren’t necessarily limited to water with options to create them from lava later in the game. 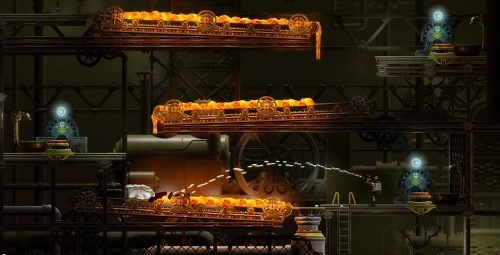 Fluros are able to interact with many objects in the game from switches to levers and cogs which all play an important role in the puzzles. They cannot be controlled directly though and must be used based on their behaviour. Some Fluros for example are attracting to light and will run towards light for example. Players themselves can interact with similar objects, climb ladders or ride zip lines around certain levels. An important element of Vessel is the idea that each puzzle has more than one solution compared to other games that generally only have a single solution which can often lead to frustration if you aren’t on the same brain wave as the developer. Vessel is one of the few puzzle games to use liquid as a core mechanic so it definitely stands apart from other options, the level design and overall steampunk feel are particularly well done. Focus on liquids makes for an interesting experience. Create Fluros to do your bidding. Multiple solutions to most puzzles.